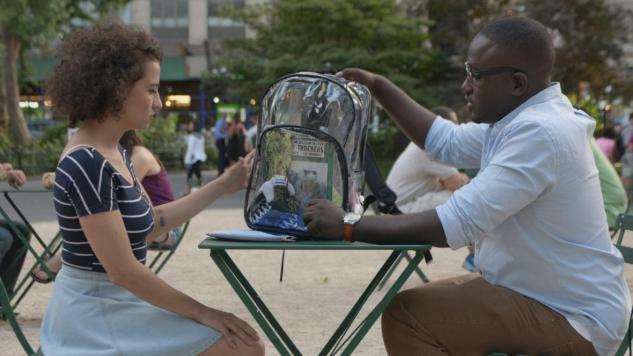 Broad City Review: "Burning Bridges"
This is the episode of Broad City that’s felt the least like a joke. I know that I always say that this show feels like the kinds of stories you tell about your life at parties, but this feels more like the kind of story you tell about your life at a therapist’s office. In short: Lincoln broke up with Ilana, and Abbi fucked things up with Trey. My friend was saying to me last week that it’s kind of pathetic for Lincoln to still be expecting something more from Ilana into season 3, and well, it kind of was. Ilana is probably never going to become the kind of person that wants to be monogamous or settle down, but Lincoln really, really was that kind of guy. He always was. And he’s sweet, thoughtful and kind. Of course he was going to find someone. We all should have seen this coming. But we didn’t. Ilana certainly didn’t. On the exact opposite side of the spectrum, things with Abbi and Trey are going so well—probably too well for Abbi’s tastes. Sure, Trey is the kind of guy who says “awesomesauce,” and he’s a little embarrassing, but he’s also really, really nice to Abbi. He genuinely cares about her and listens to her. Abbi doesn’t know how to be with a guy she can’t tell her friends about, so she’s just lying to them—which makes it difficult to manage when Ilana asks her out to her parent’s anniversary dinner on the same night Trey asks her on a date. This being a television show, these two events occur at the same restaurant, and when Abbi discovers this, she tries her hardest to go to both dinners at the same time. The resolution of this should be obvious—it is impossible to go to two different dinners at once without the other party eventually noticing—but what’s most interesting is that Abbi and Ilana seemed to have actually learned something for once. When Abbi calls Trey a joke and he overhears, she understands that not only does she really like him, but that she has to confront what that means and how she hurt him. When Ilana starts crying at the thought of Abbi dating Trey, she understands that she really cared about Lincoln, that it hurts to lose him, and while she thinks Trey is ridiculous what actually hurts is that she’s alone now. These awful people are real friends, and that’s the most charming thing about Broad City at the end of the day. They do care for each other and they need each other. I don’t exactly want them to be 100% un-awful—then the show would just kind of stop being a comedy—but I hope they’ll be, like, a smidge nicer to the people in their lives. And to themselves. And to each other. Gita Jackson is Paste’s assistant comedy editor.